Helping people the way they need to be helped can be challenging. Many know what it feels like to try to help someone and realize later on that you were only enabling them. Some have put effort into assisting others only to end up feeling used and abused. How did Jesus do so much for so many when He knew there would be those who wouldn’t do for others? Join us as we are challenged like Jesus to go The Extra Mile. Jesus is walking with a group toward Jericho and there was blind man begging. Have you ever asked the question as to why the blind man was sitting there? Someone, more than likely, had to bring him to that place. Have you ever wondered who it was? Do you ever look around and wonder about the stories of the people around you? Take some time today to say a short prayer for those that catch your attention. This man obviously needs help. Good thing for him that on this day that Jesus was walking by. But what about all the other days that he was dropped off in this spot to beg? How many weeks, months, or years had he been brought to the same spot with little progress in his life? What if the people who brought him could have done more? Can we do more? Do we have to do more? Let us know what you think about these questions on social media using #MessageMag. Can you imagine being this man? He’s dropped off daily by people who, though they are doing him a service, could do more. Do we do the same? Maybe we have weakened what it means to be a servant. Maybe we’re more like the people who try to silence those who could use a little more assistance. Have we gotten to the point like Paul that we are willing to sacrifice our freedom for the lives of others? I haven’t. What about you? 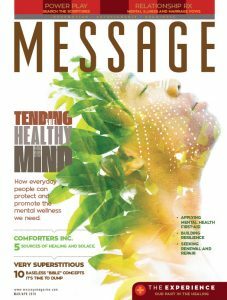 Talk to us using #MessageMag on Social Media. The Bible promises that God will deliver. When I survey the stories and happenings of Biblical History I see that, more often than not, God uses people to carry out His deliverance. Jesus has the same people who were hushing the man to carry him over. The grace in this is that even if you haven’t been bringing people to Jesus, it’s never too late to start. Maybe God wants you to carry someone to Him. It’s a big responsibility, but I know that if God asked you, He’ll empower you to do so. Is there someone for whom God wants you to be responsible? If so I’d love to personally call their name out with you in prayer. You can call and pray with me at 614-266-9568. This man could have asked for anything. He wasn’t going to waste being in the presence of Jesus with a misguided request. I expect he had been through enough for him to realize that his problem had nothing to do with anyone other than himself. That is the challenge of serving people—being able to stick with them until they realize their issues, and we see ours. When problems arise, do you check yourself before assigning blame on others? Is that hard or easy? Why? Share on Social Media using #MessageMag. When the blind man receives his sight he immediately follows Jesus. Shouldn’t our servanthood cause us to lead people to the place where they no longer need our service, but are able to stop worrying about themselves and focus on others? It takes time, patience, and sacrifice for many. Some don’t get to that point in our time with them. The cost doesn’t exempt us. Jesus had just told His disciples for the third time that He must die for the world to be saved. Immediately, He goes towards Jerusalem by way of Jericho. He did’t have to go this way because there was an alternate route, but He did because there was someone that God wanted for Him to serve. In other words, Jesus went the extra mile for one person. Are we willing to do the same? Then it happened, as He was coming near Jericho, that a certain blind man sat by the road begging. And hearing a multitude passing by, he asked what it meant. So they told him that Jesus of Nazareth was passing by. And he cried out, saying, “Jesus, Son of David, have mercy on me!” Then those who went before warned him that he should be quiet; but he cried out all the more, “Son of David, have mercy on me!” So Jesus stood still and commanded him to be brought to Him. And when he had come near, He asked him, saying, “What do you want Me to do for you?” He said, “Lord, that I may receive my sight.” Then Jesus said to him, “Receive your sight; your faith has made you well.” And immediately he received his sight, and followed Him, glorifying God. And all the people, when they saw it, gave praise to God,” Luke 18:35-39. Christ feels the woes of every sufferer. When evil spirits rend a human frame, Christ feels the curse. When fever is burning up the life current, He feels the agony. And He is just as willing to heal the sick now as when He was personally on earth. Christ’s servants are His representatives, the channels for His working. He desires through them to exercise His healing power. These lessons are for us. There are conditions to be observed by all who would preserve health. All should learn what these conditions are. The Lord is not pleased with ignorance in regard to His laws, either natural or spiritual. We are to be workers together with God for the restoration of health to the body as well as to the soul. And we should teach others how to preserve and to recover health. For the sick we should use the remedies which God has provided in nature, and we should point them to Him who alone can restore. It is our work to present the sick and suffering to Christ in the arms of our faith. We should teach them to believe in the Great Healer. We should lay hold on His promise, and pray for the manifestation of His power. The very essence of the gospel is restoration, and the Saviour would have us bid the sick, the hopeless, and the afflicted take hold upon His strength. The power of love was in all Christ’s healing, and only by partaking of that love, through faith, can we be instruments for His work. If we neglect to link ourselves in divine connection with Christ, the current of life-giving energy cannot flow in rich streams from us to the people. There were places where the Saviour Himself could not do many mighty works because of their unbelief. So now unbelief separates the church from her divine Helper. Her hold upon eternal realities is weak. By her lack of faith, God is disappointed, and robbed of His glory. It is in doing Christ’s work that the church has the promise of His presence. Go teach all nations, He said; “and, lo, I am with you alway, even unto the end of the world.” To take His yoke is one of the first conditions of receiving His power. The very life of the church depends upon her faithfulness in fulfilling the Lord’s commission. To neglect this work is surely to invite spiritual feebleness and decay. Where there is no active labor for others, love wanes, and faith grows dim. ELLEN G. WHITE (1827-1915), one of the most published authors in the world, named one of the “100 Most Significant Americans of All Time” by the Smithsonian Institution in 2014, was a co-founder of the Seventh-day Adventist Church. *You can read The Desire of Ages in its entirety online at www.whiteestate.org/onlineboks. On another Sabbath day, a man with a deformed right hand was in the synagogue while Jesus was teaching. The teachers of religious law and the Pharisees watched Jesus closely. If he healed the man’s hand, they planned to accuse him of working on the Sabbath. When questioned, “Is it lawful to heal on the Sabbath days?” Jesus answered, “What man shall there be among you, that shall have one sheep, and if it fall into a pit on the Sabbath day, will he not lay hold on it, and lift it out? How much then is a man better than a sheep? Wherefore it is lawful to do well on the Sabbath days” Matthew 12:10-12. The spies dared not answer Christ in the presence of the multitude, for fear of involving themselves in difficulty. They knew that He had spoken the truth. Rather than violate their traditions, they would leave a man to suffer, while they would relieve a brute because of the loss to the owner if it were neglected. Thus greater care was shown for a dumb animal than for man, who is made in the image of God. This illustrates the working of all false religions. They originate in man’s desire to exalt himself above God, but they result in degrading man below the brute. Every religion that wars against the sovereignty of God defrauds man of the glory which was his at the creation, and which is to be restored to him in Christ. Every false religion teaches its adherents to be careless of human needs, sufferings, and rights. The gospel places a high value upon humanity as the purchase of the blood of Christ, and it teaches a tender regard for the wants and woes of man. The Lord says, “I will make a man more precious than fine gold; even a man than the golden wedge of Ophir” Isaiah 13:12. When Jesus turned upon the Pharisees with the question whether it was lawful on the Sabbath day to do good or to do evil, to save life or to kill, He confronted them with their own wicked purposes. They were hunting His life with bitter hatred, while He was saving life and bringing happiness to multitudes. Was it better to slay upon the Sabbath, as they were planning to do, than to heal the afflicted, as He had done? Was it more righteous to have murder in the heart upon God’s holy day than love to all men, which finds expression in deeds of mercy? In the healing of the withered hand, Jesus condemned the custom of the Jews, and left the fourth commandment standing as God had given it. “It is lawful to do well on the Sabbath days,” He declared. By sweeping away the senseless restrictions of the Jews, Christ honored the Sabbath, while those who complained of Him were dishonoring God’s holy day. Those who hold that Christ abolished the law teach that He broke the Sabbath and justified His disciples in doing the same. Thus, they are really taking the same ground as did the caviling Jews. In this they contradict the testimony of Christ Himself, who declared, “I have kept My Father’s commandments, and abide in His love.” John 15:10. Neither the Saviour nor His followers broke the law of the Sabbath. Christ was a living representative of the law. No violation of its holy precepts was found in His life. Looking upon a nation of witnesses who were seeking occasion to condemn Him, He could say unchallenged, “Which of you convicteth Me of sin?” John 8:46, R.V. The Saviour had not come to set aside what patriarchs and prophets had spoken; for He Himself had spoken through these representative men. All the truths of God’s word came from Him. But these priceless gems had been placed in false settings. Their precious light had been made to minister to error. God desired them to be removed from their settings of error and replaced in the framework of truth. This work only a divine hand could accomplish. By its connection with error, the truth had been serving the cause of the enemy of God and man. Christ had come to place it where it would glorify God, and work the salvation of humanity. Did you see what I saw? We are in the last chapter of Matthew. Jesus is saying His goodbyes, and the Bible tells us that “some doubted.” They have seen miracle after miracle yet they doubted. Jesus still finds it within His heart to say “I am with you.” Have you ever felt God with you, even while you doubted Him? 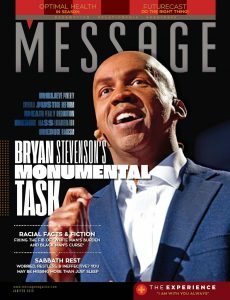 Tell us about it here at Message using #MessageMag on Social Media. The disciples were not the first to doubt. Can you imagine becoming the CEO of a company that has been in turmoil for more than 400 years, and the previous CEO turned things around only to be forced to pass it to you. Can you feel the pressure? Do you think you can do it? What would God’s words have meant to you in a time like that? 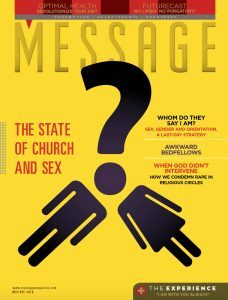 Tell us about it here at Message using #MessageMag. The most common command in the Bible is some form of “do not be afraid.” Without fail this command is accompanied by the assurance that God will be with you. Have you finally come to the place in your relationship with God that His presence is enough to get rid of stress and anxiety? To what can God’s presence give peace in your life? Share it with us here at #MessageMag so we can pray for and with you. 4) If you have children, you may know that getting them to sleep in their own bed when they are young can be a struggle. I believe it is because they sense the security of being in close proximity to their parents. It’s natural. We are God’s children, and I want you to take a moment, wherever you are to close your eyes and imagine being in the presence of God. Little do you know, you are! 5) May I give you a homework assignment? When was the last time you had a memory verse? We at Message would love to see a video of you reciting Romans 8:38-39. It’s fitting to know that nothing keep you from the love of God that is in Christ Jesus. Post it to Social Media and tag #MessageMag. Yes, the disciples doubted, but that didn’t stop Jesus from letting them know that they wouldn’t be alone. Jesus was going to the Father on our behalf, and He ensured that God would not just be with us, but in us. The disciples would face much but they would face it all with God. Do you really believe that you face every day with God? Don’t share. Just meditate on the promise that you can face the world with The Most High on your side. 7) The disciples would set off a chain reaction that resulted in countless people over the next 2000 years believing in the Lord Jesus Christ. Amid the peaks and valleys, suffering or success, for those who chose to follow Christ, one thing always rang through and true. It was the promise that His children were never alone. Thus Christ gave His disciples their commission. He made full provision for the prosecution of the work, and took upon Himself the responsibility for its success. So long as they obeyed His word, and worked in connection with Him, they could not fail. Go to all nations, He bade them. Go to the farthest part of the habitable globe, but know that My presence will be there. Labor in faith and confidence, for the time will never come when I will forsake you. The Saviour’s commission to the disciples included all the believers. It includes all believers in Christ to the end of time. It is a fatal mistake to suppose that the work of saving souls depends alone on the ordained minister. All to whom the heavenly inspiration has come are put in trust with the gospel. All who receive the life of Christ are ordained to work for the salvation of their fellow men. For this work the church was established, and all who take upon themselves its sacred vows are thereby pledged to be co-workers with Christ. “The Spirit and the bride say, Come. And let him that heareth say, Come” (Revelation 22:17). Everyone who hears is to repeat the invitation. Whatever one’s calling in life, his first interest should be to win souls for Christ. He may not be able to speak to congregations, but he can work for individuals. To them he can communicate the instruction received from his Lord. Ministry does not consist alone in preaching. Those minister who relieve the sick and suffering, helping the needy, speaking words of comfort to the desponding and those of little faith. Nigh and afar off are souls weighed down by a sense of guilt. It is not hardship, toil, or poverty that degrades humanity. It is guilt, wrongdoing. This brings unrest and dissatisfaction. Christ would have His servants minister to sin-sick souls. The disciples were to begin their work where they were. The hardest and most unpromising field was not to be passed by. So every one of Christ’s workers is to begin where he is. In our own families may be souls hungry for sympathy, starving for the bread of life. There may be children to be trained for Christ. There are heathen at our very doors. Let us do faithfully the work that is nearest. Then let our efforts be extended as far as God’s hand may lead the way. The work of many may appear to be restricted by circumstances; but, wherever it is, if performed with faith and diligence it will be felt to the uttermost parts of the earth. Christ’s work when upon earth appeared to be confined to a narrow field, but multitudes from all lands heard His message. God often uses the simplest means to accomplish the greatest results. It is His plan that every part of His work shall depend on every other part, as a wheel within a wheel, all acting in harmony. The humblest worker, moved by the Holy Spirit, will touch invisible chords, whose vibrations will ring to the ends of the earth, and make melody through eternal ages. Jesus makes a bold claim and command: “Repent of your sins and turn to God, for the Kingdom of Heaven is near” (Matthew 4:17, NLT). I wonder if the people of that time had heard that before as we have? If you knew that Jesus was coming to tomorrow would there be anything you would do differently? What would it be? 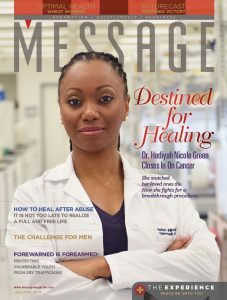 Let us know here at Message on Social Media using #MessageMag. Why would Jesus begin this statement with a call to repent? I’ve made some mistakes in my life but I’m not a bad person and I bet you feel the same, right? If the Kingdom is at hand, does that really mean I have to say sorry for all I’ve done? What do you think? Let us know online using #MessageMag. Not long after He declared that “the kingdom of God is at hand,” (KJV), Jesus went up on a mountain and preached a sermon. In the midst of that sermon He elaborated on the concept of His “Kingdom.” He also said that His Kingdom and “His” righteousness should be the priority in our searching and seeking. Why would He call a place a “he”? Give us your thoughts online using #MessageMag. Is it possible that the Kingdom that Jesus spoke of wasn’t a place, but rather a Person? Even before Jesus started His ministry and preached about the Kingdom the Holy Spirit led several seekers to the Kingdom and the grace for which they had been waiting. What could this mean? How could people look at a child and see the Kingdom of God? Share with us your opinions using #MessageMag on Social Media. How sad it would be for the Kingdom to have shown up and yet the people who were waiting for it, miss it. It seems that’s what happened when Magi came to Herod. They were looking for a King and Kingdom but no one else was. The King had come and no one knew but a select few. How could this happen? Is it possible it could happen again? What do you think? 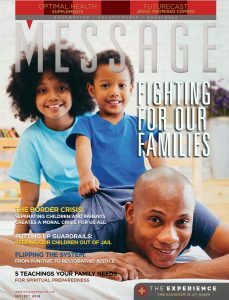 Let us know using #MessageMag. Jesus implied several times that the Kingdom of Heaven is not just on its way, but rather it is already here. He said this in or around AD 30. It is now 2018. What is going on? Did we miss it? Were we not ready? Has God forgotten about us? What answers can you give us? Share using #MessageMag. The Kingdom of Heaven is Jesus. Yes, there will be a place where that He has prepared for us, and will take us, but His Kingdom is available to us now, in Him. Let us not be like the people of old who were so focused on the Kingdom coming that we miss out on the Jesus that is right in front of us here and now. Jesus came into Galilee, preaching the gospel of the kingdom of God, and saying, The time is fulfilled, and the kingdom of God is at hand: repent ye, and believe the gospel Mark 1:14, 15. The burden of Christ’s preaching was, “The time is fulfilled, and the kingdom of God is at hand; repent ye, and believe the gospel.” Thus the gospel message, as given by the Savior Himself, was based on the prophecies. The “time” which He declared to be fulfilled was the period made known by the angel Gabriel to Daniel. “Seventy weeks,” said the angel, “are determined upon thy people and upon thy holy city, to finish the transgression, and to make an end of sins, and to make reconciliation for iniquity, and to bring in everlasting righteousness, and to seal up the vision and prophecy, and to anoint the most holy” Dan. 9:24. A day in prophecy stands for a year. (See Num. 14:34; Ezek. 4:6.) The seventy weeks, or four hundred and ninety days, represent four hundred and ninety years. A starting point for this period is given: “Know therefore and understand, that from the going forth of the commandment to restore and to build Jerusalem unto the Messiah the Prince shall be seven weeks, and threescore and two weeks,” sixty-nine weeks, or four hundred and eighty-three years, Daniel 9:25. The commandment to restore and build Jerusalem, as completed by the decree of Artaxerxes Longimanus (see Ezra 6:14; 7:1, 9, margin), went into effect in the autumn of B. C. 457. From this time four hundred and eighty-three years extend to the autumn of A. D. 27. Then, said the angel, “He shall confirm the covenant with many for one week [seven years].” For seven years after the Savior entered on His ministry, the gospel was to be preached especially to the Jews; for three and a half years by Christ Himself; and afterward by the apostles. A. D. 31, Christ the true sacrifice was offered on Calvary. Then the veil of the temple was rent in twain, showing that the sacredness and significance of the sacrificial service had departed. The time had come for the earthly sacrifice and oblation to cease. The one week—seven years—ended in A. D. 34. Then by the stoning of Stephen the Jews finally sealed their rejection of the gospel; the disciples who were scattered abroad by persecution “went everywhere preaching the word” (Acts 8:4); and shortly after, Saul the persecutor was converted, and became Paul, the apostle to the Gentiles. The time of Christ’s coming, His anointing by the Holy Spirit, His death, and the giving of the gospel to the Gentiles, were definitely pointed out. It was the privilege of the Jewish people to understand these prophecies, and to recognize their fulfillment in the mission of Jesus. Christ urged upon His disciples the importance of prophetic study. Referring to the prophecy given to Daniel in regard to their time, He said, “Whoso readeth, let him understand” Matthew. 24:15. “Then said Jesus to them again, Peace be unto you: as my Father hath sent me, even so send I you,” John 20:21. On reaching Jerusalem the two disciples enter at the eastern gate, which is open at night on festal occasions. The houses are dark and silent, but the travelers make their way through the narrow streets by the light of the rising moon. They go to the upper chamber where Jesus spent the hours of the last evening before His death. Here they know that their brethren are to be found. Late as it is, they know that the disciples will not sleep until they learn for a certainty what has become of the body of their Lord. They find the door of the chamber securely barred. They knock for admission, but no answer comes. All is still. Then they give their names. The door is carefully unbarred, they enter, and Another, unseen, enters with them. Then the door is again fastened, to keep out spies. “But they were terrified and affrighted, and supposed that they had seen a spirit. And He said unto them, why are ye troubled, and why do thoughts arise in your hearts? Behold My hands and My feet, that it is I Myself: handle Me, and see; for a spirit hath not flesh and bones, as ye see Me have. And when He had thus spoken, He showed them His hands and His feet.” . . .
At the birth of Jesus the angel announced, Peace on earth, and good will to men. And now at His first appearance to the disciples after His resurrection, the Saviour addressed them with the blessed words, “Peace be unto you.” Jesus is ever ready to speak peace to souls that are burdened with doubts and fears. He waits for us to open the door of the heart to Him, and say, Abide with us. He says, “Behold, I stand at the door, and knock: if any man hear My voice, and open the door, I will come in to him, and will sup with him, and he with Me” Revelation 3:20.